Although 10 Most Wanted is being piloted on plastic objects, the purpose of the project is to create a methodology suitable for use by different sorts of museums and heritage sites. In this endeavour we are being helped by an Advisory Group comprising people with expertise in a wide range of other subject areas. The project partners held a project meeting at the Museum of Design in Plastics on Thursday 29th August. Susan and her colleagues kindly arranged for some excellent weather and a display by the Red Arrows - nothing to do with Bournemouth Air Show being the same day. In the photograph below, enjoying the sunshine and arranged according to colour and pattern are, in black and white, Pam Langdown and Susan Lambert, in chequered shirts, Louise Dennis, Marcus Winter and Phil Blume. Like the first User Experience meeting a month earlier, this one was held at our base at The Regency Town House and was again with Danny Hope. Danny, looking more rabbinical by the day, is pictured below practicing the laying-on of hands at the end of our morning session. When we came up with the idea of 10 Most Wanted it was clear to me, as a museum curator, what the challenges for the people who played the game would be. It was to replace all those ‘unknowns’ in the documentation of our objects with hard facts in order to make it conform to the requirements of Accreditation, the scheme administered by Arts Council England in partnership with CyMAL: Museum, Archives, Libraries Wales; Museums Galleries Scotland and the Northern Ireland Museum Council, which sets nationally agreed standards for museums in the UK. 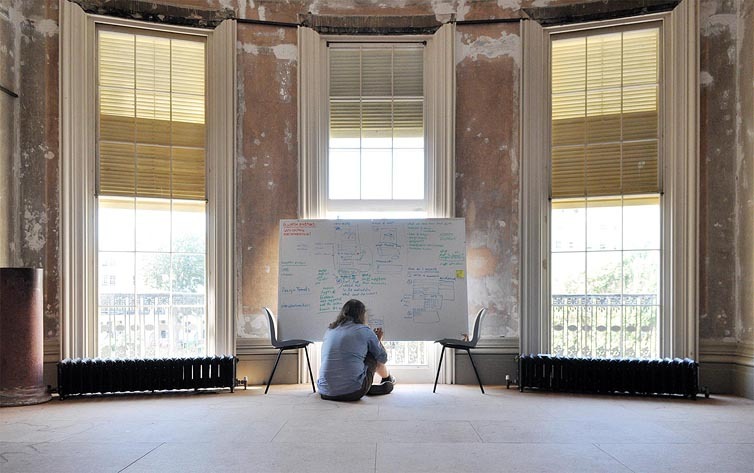 The first User Experience meeting of the project was held here in Brighton on 9th July in the yet-to-be-restored drawing room of our base at The Regency Town House heritage centre. Selecting objects with which to play 10 Most Wanted has been much more demanding than I expected. The idea for the research project came from the fact that when the MoDiP collection became available on line through the website built for us by Adaptive Technologies, Phil, our lead contact there, was astonished by how often the word ‘unknown’ appeared against an object’s designer, manufacturer, country of manufacture or date. Sometimes we are even unsure of the specific plastic from which a product is made and its method of manufacture. We, the 10 Most Wanted team – that’s Marcus, Phil and I, attended a Digital R&D event at Nesta last week. It involved all the so-called nine first generation projects announced in February and also the nine second generation projects announced earlier this month. Each project was represented by upwards of three people so there was quite a crowd and a wonderful variety of arts represented: theatre, painting, opera, dance, storytelling, music, sculpture, and curation. It was a great opportunity to meet people engaged on parallel projects. The aim was to get an outsider's view of the project and of the website that would be at the heart of it. 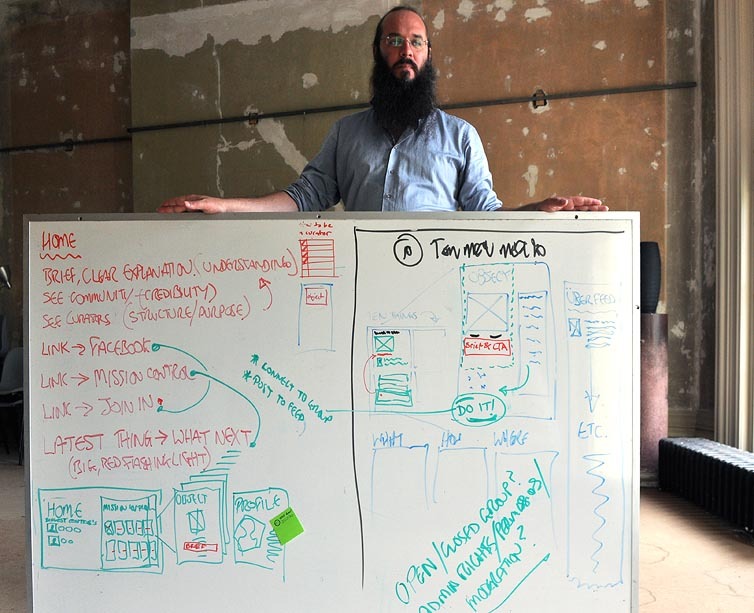 Specifically, I wanted to understand better what a visitor might expect to find when they first land on the site, how to explain the project very simply and how to engage the user as quickly as possible. The 1st Workshop, with a group of three students. This first workshop was intended to be a short, spontaneous session with the aim of introducing the group to the project and to get some basic ideas down on paper.